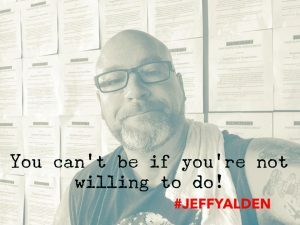 We hope you have been taking daily action on the principles laid out by motivational speaker and Amazon bestselling author Jeff Yalden in his brand-new workbook and planner, The BOOM 28 Day Boot Camp: Creating a Life of Success. Find Motivation. Crush Goals. Overcome Obstacles. Live with Purpose. “If you are jumping in just to see what I’m saying, that’s fine – but if you go in half-assed, you are going to get half-assed results. That’s the bottom line,” said Yalden. Go back and look at the previous daily assignments. Let the principles sink in. You must put in the daily work to be truly effective in this program. If it was easy, everybody would be doing it, according to Yalden. STOP here and review everything from Day One through Day 11. Your plan should be SIMPLE, MEASURABLE, ATTAINABLE, RELEVANT and TIMELY. In this episode of The BOOM Podcast, Jeff talked about his friend, author and speaker Jake Ballentine, author of Your Number One Goal [Listen to their earlier conversation in Episode 4]. Ballentine had a goal to run a 5K in under 30 minutes – a SIMPLE and MEASURABLE goal. “He would run every single day and measured his success. He knew where he had to go,” Jeff said, adding that this goal was ATTAINABLE and RELEVANT. Ballentine’s “why” was stronger than his excuses, and this was also TIMELY – he had given himself a timeframe in which to accomplish this. What are your goals? What is your plan? “Put the goals in place to achieve the plan, whether it’s a three-month goal, a six-month goal, a one-year goal or a five-year goal. Have a goal in place to achieve that plan, which comes as a result of your dream.,” Yalden said. Remember: Life is not a race. Life is a journey – and we are all on our own paths. “You take the dream out of your head. You put it down on paper. Now you have a plan. You re-engineer yourself as if you have already achieved it, and you work from that point backwards. Do you have a set time in which you can allocate every single day to focusing on your goal? If you haven’t done the last eleven days, go back and do it.